Searching for the world's best drinks and what makes them extraordinary. Searching for the world's best drinks and what makes them extraordinary. EZdrinking is a drinks blog by Eric Zandona that focuses on distilled spirits, wine, craft beer and specialty coffee. Here you can find reviews of drinks, drink books, articles about current & historical trends, as well as how to make liqueurs, bitters, and other spirit based drinks at home. From bark to Bourbon: The Wild Yeast of Firestone & Robertson Distilling Co.
Yeast is an amazing organism. It’s a fungus, one we encounter every day—not only through the fermented beverages we drink and the bread we eat, but also in the very air we breath. For millennia, humankind collaborated with wild yeast to produce wine, beer and bread, yet with no understanding how it functioned on a molecular level. With the invention of the microscope, we developed the skills and techniques to domesticate a few strains of yeast suitable to our needs, but the vast majority remain wild, floating on the wind, ready to be discovered (or avoided). In 2009, Rob Arnold moved from Tennessee to Dallas to begin a doctoral program in biochemistry. Having earned a bachelor’s degree in microbiology, Arnold was at home in the labs of the University of Texas. He spent many of his days isolating marine bacteria from samples of sea water. Yet, in his off time, Arnold began to dream of starting a distillery. His family had been in the alcohol industry for generations, and it seemed to him the right avenue for applying his skills and passion. As Arnold began exploring the idea of distilling, he met Leonard Firestone and Troy Robertson, who were already in the process of starting a distillery in Fort Worth. As the three men talked, they realized they shared a common vision, and that each possessed skills valuable to a potential collaboration. Even from the beginning, Firestone and Robertson had known that they wanted a proprietary yeast strain for their wheated bourbon. And Arnold seemed to be the right man to make that a reality. In September 2010, not long after the founding of the Firestone & Robertson Distilling Company, Arnold joined the team and went to work looking for yeast. But to do it right, he was going to need a lab. He reached out to local colleges, and Professor Dean Williams of Texas Christian University responded. Williams helped Arnold set up a lab, advised him on using equipment, and even helped him gain adjunct faculty status so he could come and go at the University as needed. to wort, intended to encourage the growth of yeast species suited to fermentation. However, when Arnold examined his first set of plates, none contained a desirable yeast strain. Because not all yeast species are capable of fermenting the complex sugars within a bourbon mash into alcohol, the three focused specifically on finding Saccharomyces cerevisiae, a variety widely used by brewers and winemakers. Due to millennia of selective pressure, S. cerevisiae has evolved into an effective fermenter of maltose, capable of surviving in an alcohol solution at concentrations deadly to most other bacteria and micro-organisms. As the search for S. cerevisiae continued, Arnold headed out of Fort Worth to Rancho Hielo Brazos in Glen Rose, Texas. The ranch manager there, as it turned out, happened to have a background in botany. Arnold spent half a day with the ranch manager traversing the property, collecting samples from the dirt and a variety of plants. Back at the lab, the 20 samples he collected netted hundreds of different bacteria and fungi, including yeast. Once again, Arnold went through the work of isolating each of the yeast strains by plating and re-plating them repeatedly. In the end, the 20 samples Arnold brought back from the ranch yielded 100 separate yeast strains. To whittle that number down to a manageable size, he used a technique called Polymerase Chain Reaction to isolate the DNA of each strain. Upon analysis, it turned out 11 of the 100 strains were S. cerevisiae. Arnold checked his notes, and discovered that all 11 came from just three sources on the ranch: a cactus fruit, an oak tree and a pecan tree. Arnold then tested his 11 wild yeast strains against a couple of commercial strains in a series of fermentation trials. For a month, he pitched these yeasts into a standardized wort and recorded when fermentation began, when it stopped, and how well each strain consumed the available sugars. He noticed that almost all of the wild S. cerevisiae strains began fermenting right away, although most stalled after 36 hours. Out of the 11 wild yeast strains, only three were capable of fully fermenting the wort and able to hold up to alcohol without dying. The team ran fermentation results from the final three wild strains, plus a commercial strain, through a blind sensory analysis. They nosed and tasted the distiller’s beer and the white dog resulting from each yeast strain to see which they liked best. All three picked the same strain as their clear favorite, which they named Brazos. official state tree of Texas since 1906. From the beginning, Firestone and Robertson had dreamed of creating a Texas bourbon that represents the home that they love. It was pure serendipity that, after all of Arnold’s hard work to find a wild yeast strain that could imbue their bourbon with the character of Texas, they found it waiting on a Texas pecan nut. To protect all that they had accomplished, their Brazos yeast strain is now stored in deep freezers at the distillery as well as at a couple of universities in the area. If Firestone & Robertson ever needed to start from scratch, they have a number of ready samples stored for just such a purpose. Brazos yeast strain. Once fermentation is complete, the wash is pumped into the stills grain and all. Firestone & Robertson stills are a pot-column hybrid, custom built by Vendome Copper & Brass Works, designed so they can distill bourbon in a single pass. When enough hearts are collected, they pour the spirit into 53 gallon barrels from Independent Stave. Slowly but surely the stacked barrels are filling up the open floor plan of their brick warehouse, with the oldest barrels in a loft overlooking the distillery floor. According to Arnold, the brick helps to moderate the hot summer temperatures, which can reach into the 100s, and also keeps temperatures stable through the mild winters. In the loft, a barrel marked “Brazos” has been quietly sitting for three years, working its magic with the spirit inside. Arnold, using a copper whiskey thief, drew a small sample and poured it into a nosing glass. Three years in, their bourbon has a fantastic color of deep amber and burnished copper. A nice aroma of vanilla, cinnamon and caramel danced in concert with the oak just above the rim of the glass. Higher notes of floral and fruity esters lingered faintly in the background. At first taste there is an immediate impression of young wood mingled with walnuts, and a lingering maple syrup sweetness that floats on the tongue. Even at barrel strength the bourbon was supple and smooth, without any harsh heat. in the watershed of the Brazos River. Originally published as part of the "Defining Craft" series in Distiller Magazine (Summer 2015): 90-92. On October 4th and 5th I attended White Labs' Yeast and Fermentation class for distillers down in San Diego. The class was packed full of good information and it was attended by about a dozen new distillers. The attendees ranged in experience from professionals brewers to home beer and wine makers interested in starting a distillery. Overall the class was very well organized and the talks were professionally presented. 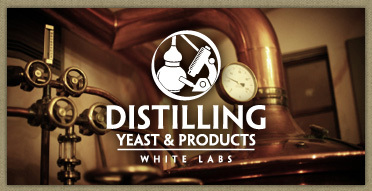 On October 4th and 5th I'm going to be in San Diego, attending White Labs' 4th annual Yeast and Fermentation Workshop and Webinar for Distillers. The two day workshop will cover a broad range of topics related to yeast, such as, basic biology, how to select strains for specific distillates, and the sensory impact of yeast on distilled spirits. The first day of seminars will be at White Labs, and the second day's practicum will be held at Ballast Point Spirits. Lee Medoff of Bull Run Distillery in Portland took the class last year and I talked with him to get his impression of the class. Lee has worked as a brewer, vintner and distiller for quite some time and told me he was interested in picking up some tips about low nutrient cane sugar fermentations for rum. Lee said that he particularly liked the hands on yeast hydration and culturing lab. And, in his opinion, one of the best parts of the workshop were the unstructured times he could talk one on one with the White Labs staff and the other distillers, trading tips and best practices. Like with any two day workshop there were a couple of topics he wanted more of. But, when he returned to Bull Run, Lee brought back some new yeast protocols that required some trial and error to get just right for his distillery. However, he seems to feel that the workshop helped him improve his fermentations for rum. Lee told me that since he has taken the class, he has recommended it to all of the members of the Oregon Distillers Guild. That sounds like a resounding recommended to me and I'm excited that I can attend. For anyone interested in improving their yeast management and or learning about good fermentation practices particular to the needs of distillers, this sounds like the workshop for you. To find out more details about the class call White Labs at 1-888-5-Yeast-5 or check out their website.